Epic Discovery’s Ridge Rider Mountain Coaster offers thrills on a 3,400-foot track. 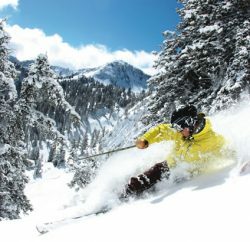 Thrilling activities abound at Heavenly Mountain Resort at Lake Tahoe. I’m peering over the side of the mountain, arms planted at my sides, knees slightly bent, heart racing, contemplating the steep drop and the turns that lie ahead. It’s not ski season, though I feel similarly—that same burst of adrenaline before making my descent down steep terrain at high altitude. Rather, I’m strapped into my seat, about to experience the Ridge Rider Mountain Coaster for the first time, a childlike grin spreading across my face as I push the sled’s levers forward and start to pick up speed. The gravity-based alpine coaster is one of many on-mountain additions launched June 18 at Heavenly Mountain Resort as part of parent company Vail Resorts’ Epic Discovery initiative, which transports its wintertime ski destinations into summertime playgrounds for all ages, and all levels of adventurers, from daredevils to those daunted by heights. I find myself somewhere in the middle of this spectrum as I race down a 300-vertical-foot drop and loop around a track built into the side of the mountain. Though each sled gives individual riders full control of their speed, I don’t attempt to slow down; rather, I will myself not to touch the braking system as I whiz by trees and natural rock formations. Somehow, I manage to take in the unparalleled scenic views of Lake Tahoe in the background while simultaneously conquering my fear of roller coasters and relinquishing control, knowing full well that when the ride is over, I’ll probably want to try it again. Such is the theme of my days spent with Epic Discovery at Heavenly: The activities are in a setting so beautiful that I almost forget about the intimidations—heights, high speeds, the unknown—which are squashed, too, by the sheer joy that each on-mountain thrill brings. The Skyway Canopy Tour boasts seven zip lines and two aerial bridges. 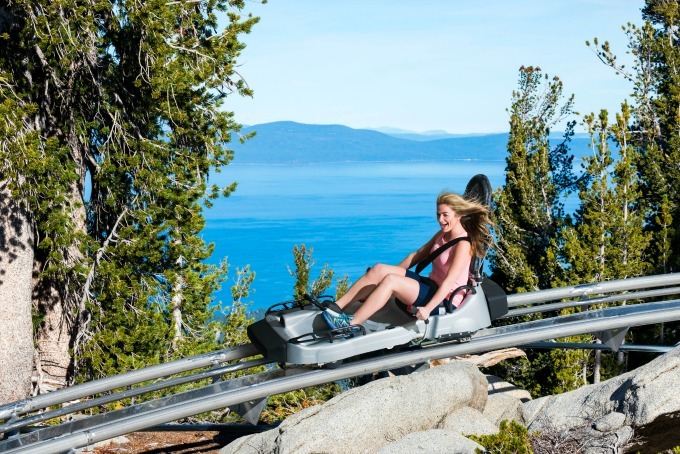 Though the coaster is arguably the most fun of the activities, it’s just the beginning of my itinerary at Heavenly’s Adventure Peak, which serves as the top-of-the-gondola base area and the hub of all the summer offerings. Before I know it, I’m stepping into a harness and being trained on how to brake and maneuver along a zip line—skills that come in handy when I embark on the Skyway Canopy Tour, which boasts seven unique zip lines, two aerial bridges and one rappel station. I climb up a ladder to the first wooden platform, built around the trunk of a tree at a height significant enough to get my heart pounding before my guide says, “Zip away!” and I launch off, clutching the handles and keeping my eyes on the next platform ahead. Fortunately, the zip lines gradually increase in speed and length, so that when the seventh line comes into sight, I’m ready to relax and let my body propel forward while I enjoy the longer ride. And, after I rappel down the final platform, I’m still not sure what was more beautiful: the serene views of the national forest and the wildlife that surrounds me, or the glimmering blue of Lake Tahoe, visible in the distance for nearly the entire tour. The Discovery Forest Ropes Course, too, takes me out of my comfort zone: The treetop course requires me to navigate around each “element,” choosing between green or blue (beginner to intermediate) or black (advanced) challenges—a ranking system similar to that used for most ski mountains’ winter terrain. Completely integrated into the wooded area in which it’s built, the ropes course enables adventurers to move themselves along the obstacles in the trees. From bridges made of swinging planks to monkey bars made of rope and thin wires stretched across diminutive platforms, the challenges test all skill levels, melding the beauty of the national forest with customizable adventures high above the ground. The Blue Streak Zip Line sends riders soaring at up to 50 miles per hour or more, based on the rider’s weight. It’s the Blue Streak Zip Line, however, that truly tests my gall. Though I didn’t ask, I was at first certain that the name “Blue Streak” was inspired by the flash of blue lake that’s visible along the left-hand side of the 3,300-foot-long zip line that takes riders at speeds of more than 50 miles an hour from the top of the Tamarack Express chairlift at 9,725 feet and back down to Adventure Peak. This activity requires a chairlift ride, and it provides an unparalleled burst of adrenaline unlike anything I’ve experienced before. Once I’m secure in my seat-like harness, my knees pressed against a gate that will eventually burst open, sending me flying through the blue sky, I take a deep breath and remind myself to appreciate the view. And it doesn’t, in fact, flash by me. Rather, as I dash across the zip line, Lake Tahoe the only thing in sight, I have more than enough time to consider how lucky I am to experience a ski resort in the height of summer in this particular way, the sun shining on my face and the crisp mountain air whipping through my hair. The Blue Streak Zip Line is, in fact, an epic ride. The Bear Cub Ropes Course is geared toward families with younger children. Though I was focused on boldly embracing each adventure with newfound confidence, I couldn’t help but notice the number of families—with young children—that were partaking in the fun as well. 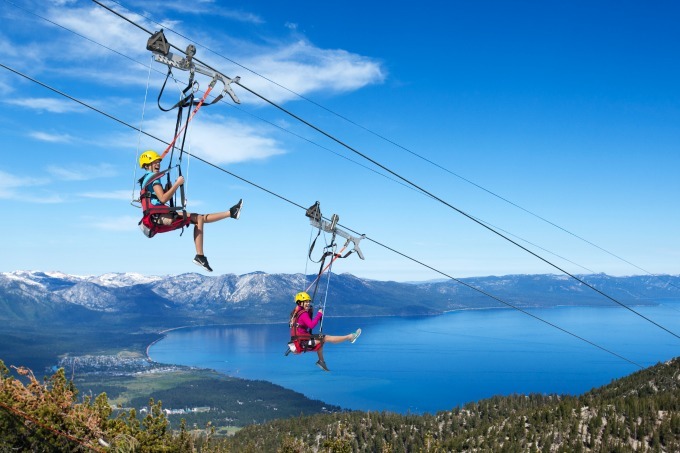 There is truly something for everyone at Heavenly’s Epic Discovery, even if harnesses and heights aren’t your thing. 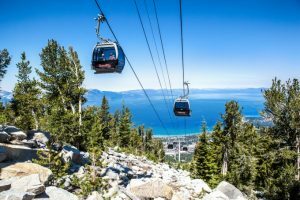 Take the scenic gondola ride, for example: The 2.4-mile ride, which begins in Heavenly Village near Stateline, Nev., and stops at the picturesque observation deck, offers breathtaking views of Lake Tahoe from an altitude of 9,123 feet. Hiking trails abound, too, and are accessible from different areas on the mountain, including Adventure Peak and following a short jaunt up the Tamarack Express chairlift. Trails range from short, less-than-a-mile loops, to longer, steeper hikes that may take an hour or two to traverse. 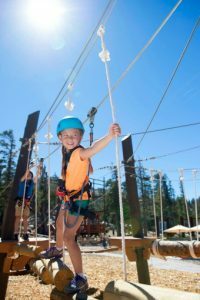 If your family is, in fact, into ropes and rapid descents, there are countless Epic Discovery activities for families of all ages. The summer tubing hill and the child-friendly Red Tail Flyer Zip Line mark the perfect start for a day of fun. And there are countless other adventures tailored to small groups or families, from the Black Bear Ropes Course, which is slightly shorter than the Discovery Forest course, to the Hot Shot Zip Line, which allows four people at a time to race each other at 40 miles an hour down four parallel lines that make up a 1,000-foot-long stretch, and Discovery Day Camp, a daylong opportunity for children ages 5-12 to explore with camp leaders. Ultimate Adventure and Little Explorer passes—which include the gondola ride to the adventure area—can be purchased for all-day access to the Epic Discovery activities, which are open for exploration by visitors daily through Sept. 5, and then on Fridays, Saturdays and Sundays, Sept. 9-25. 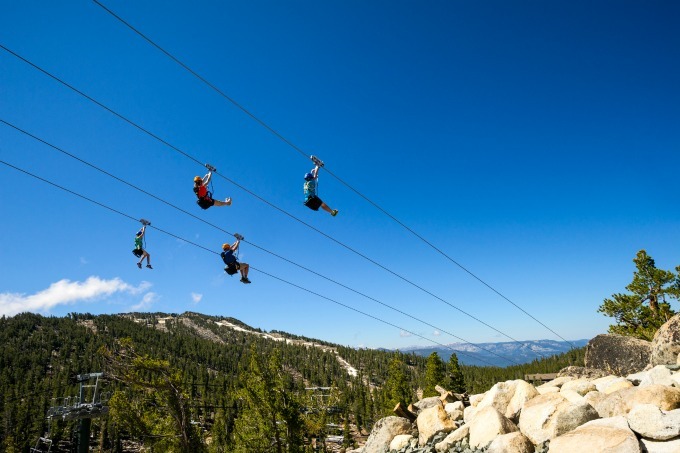 Four riders can race each other along the 1,000-foot-long Hot Shot Zip Line. Though my on-mountain adventure was both mentally and physically challenging, it was also an educational journey. Epic Discovery was made possible at Heavenly, after all, through a partnership with the U.S. Forest Service and in collaboration with the League to Save Lake Tahoe and The Nature Conservancy. When Congress passed the 2011 Ski Area Recreational Opportunity Enhancement Act, Vail Resorts led the way by being the first to submit and implement summertime activity plans to the U.S. Forest Service; today, Heavenly’s Epic Discovery program joins that of Vail Mountain’s and Breckenridge’s warm-weather mountain offerings. The goal of Epic Discovery and of the partnership is to promote educational opportunities through exciting, adventurous outdoor experiences. This is a critical component of the initiative, and it’s embedded into nearly every aspect of the activities. 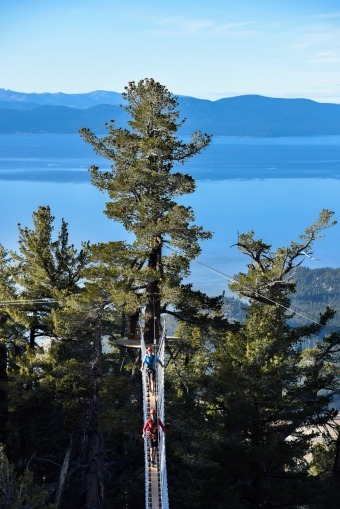 During my Skyway Canopy Tour, for example, the guides, who are also trained by the U.S. Forest Service, discussed and pointed out different species of local trees and animal life, and we talked about the health of Lake Tahoe and climate change. In addition to scenic gondola rides and exciting adventures, Epic Discovery allows visitors to connect more deeply with nature through educational opportunities. Story Stakes—interpretive stories about native animals, plants, trees and the environment—were planted throughout all of the activities at Adventure Peak, so that passersby could take in photos and fun facts while they enjoyed their surroundings. Animal Ability Stations, also dispersed throughout Adventure Peak, offer hands-on experiences for learners of all ages to explore Tahoe’s animal life. And Pathway Stones, placed along the trail from the Granite Peak Climbing Wall to Tamarack Lodge, provide boulder-embedded stories of the evolution of the Tahoe area, from its early pioneers to present-day preservation efforts. Finally, Vail Resorts created a “1% for the Forest” program, where one percent of the revenue from all summer activities and lift tickets will go directly back to The Nature Conservancy. This funding will support further forest restoration projects on national forest lands, as well as enable the mountain to continue to promote nature education and awareness and offer its summertime landscape as a place for outdoor adventure, learning and connectedness with the natural environment—which is, after all, what Epic Discovery is all about. After you work up an appetite at Epic Discovery, recharge with one of these mouthwatering mountain dining options. Grab a cup of coffee or a smoothie, granola bar or fruit while you take in the views off the observation deck, the scenic gondola’s midway stop and the perfect photo opportunity. Enjoy a bite-sized, freshly made donut at the base of the gondola before you start your day—or as a sweet reward after an action-packed outing. This outdoor kiosk is located at Heavenly Peak at the top of the gondola, offering an easily accessible snack or refreshing glass of lemonade between adventures. From artisan pizzas to a full salad bar and cocktails and beers at Bar 9150, Tamarack Lodge offers something for the whole family. 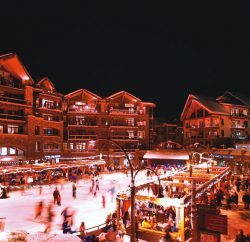 For more information about Heavenly Mountain, Epic Discovery and for dining, lodging and mountain details, visit skiheavenly.com.